Join USk-Chicago in Adding to Chicago's Art Story! To add to the great announcement about our June 7-8, 2014, seminar location here’s a little color commentary about the Palette and Chisel Academy of Fine Arts. It's a not-for-profit art club and academy founded in 1895. It’s been located in an 1870’s circa mansion in Chicago’s Gold Coast neighborhood since 1921. Many well known artists have been associated with Palette and Chisel including Fred Larson, Charles Russell, William Merritt Chase, Alphonse Mucha, Walter Ufer, and Richard Schmid, to name a few. Palette and Chisel Academy of Fine Arts offers non-instructed open studios with live models as well as classes and workshops for all levels of experience in many aspects of realistic art. 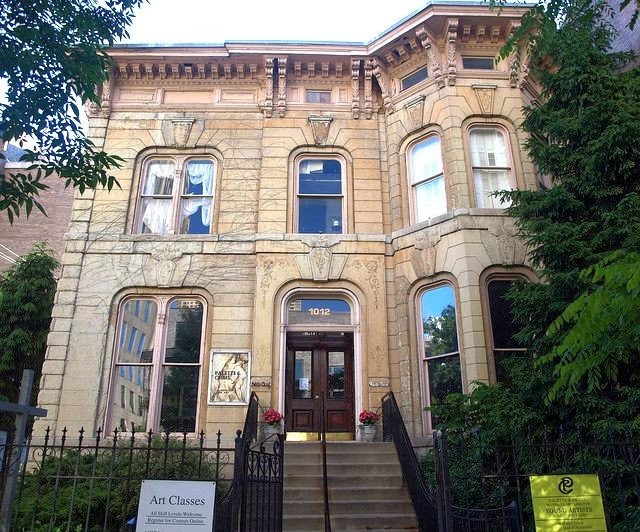 Today, as well as throughout it’s long history, it is a respected institution for representational art in Chicago. Stay tuned here and to FaceBook, Twitter, Pinterest and Instagram for further updates! We hope you'll join us in adding to the Chicago art story! Did you know that there are people who plan their whole year's worth of vacations in early January? Maybe you are one of them? If you are good for you. That is awesome. I have trouble with that because I now have more than just me to account for in my plans and coordination is not our strong suit. So let's think about this. If you are able to plan your vacations and getaways months in advance, have you ever thought about planning a "sketch vacation?" I heard about these recently and it sounds like something I could really get into. This would be combining two of my favorite things in one trip: art and travel. I will typically journal my vacations as a way to gain a better experience on the vacation and it enhances my family's vacation as well. I actually much prefer sketching on my vacations now than building sand sculptures like I used to do when my son was younger. As I write this, the holiday shopping season is upon us when people young and old are formulating their "wish lists." Retailers, accordingly, are not shy about making suggestions for interesting items that one might want to add to their list by punishing us with promotions and commercials that attack all of our senses. I wonder if, in there somewhere for those organized types, if there may also be a "wish list" for vacation destinations. Presuming that this could actually happen, allow me to make a suggestion for a weekend getaway for you and your art bag. Urban Sketchers Chicago will be hosting their very own sketching Seminar weekend in the great city of Chicago on June 7th and 8th, 2014. 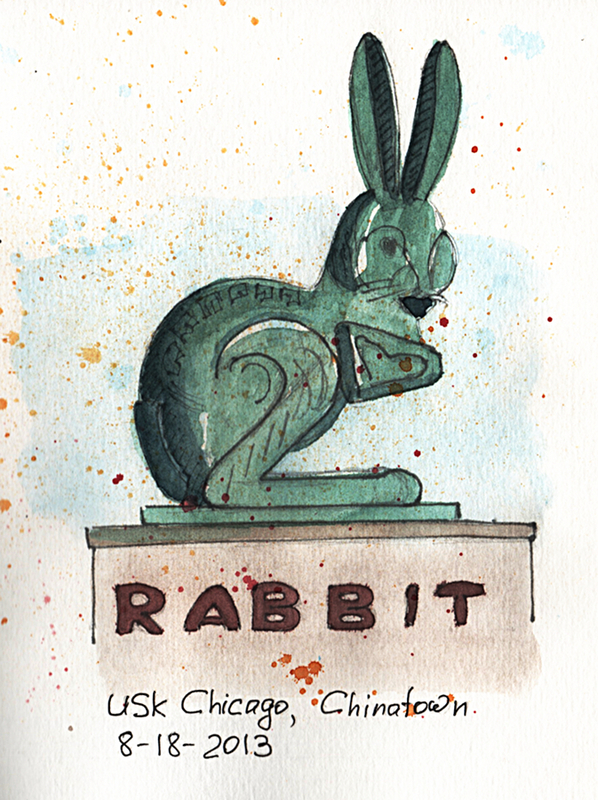 The event will attract local and visiting urban sketchers from near and far. While sketching at various locations through out downtown Chicago, some of the most respected and qualified instructors will be teaching workshops surrounding on location sketching, color theory, and choosing what to sketch just to name a few. Registration is recommended. 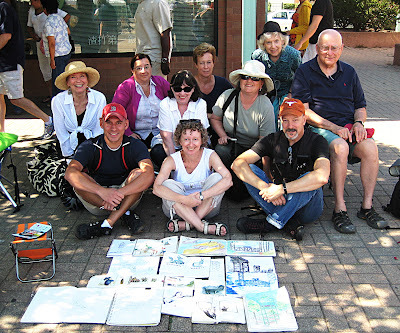 Urban Sketchers (USK) are a local community of artists who come together with a common interest of sketching in urban settings, socializing with like-minded artists and learning some new tips along the way. They practice sketching various scenes that often include interesting architecture, landscaping, people, animals and sketching anything else in their cities, towns and villages in which they live, work or have traveled. It is a nonprofit organization that is dedicated to raising the awareness of artistic storytelling and educational value of drawing on location, promoting its practice and connecting people from around the globe. If this sounds like fun and you would like to check out the Urban Sketchers' activity, simply go to the following pages and look at some of the examples. Hope for the "technical zombie?" I heard an interesting quote at a user experience workshop last week: "Our smart devices and screens are making stupid decisions on our behalf all of the time...We are not in control. We are at odds with social etiquette. They are starting to shift our social norms. Walking zombies are now the social norm...Our devices are making us miss out. We are experiencing life through a filter." Thankfully the act of carrying and sketching in a notebook has the opposite effect. We become more observant to our surroundings. We look up at the world around us. We bring focus to the mundane and common objects. 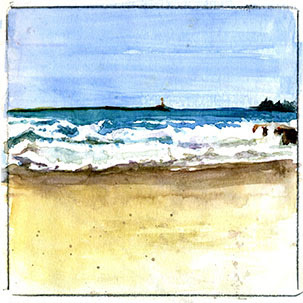 And what we record in our sketchbooks are there for our enjoyment forever. 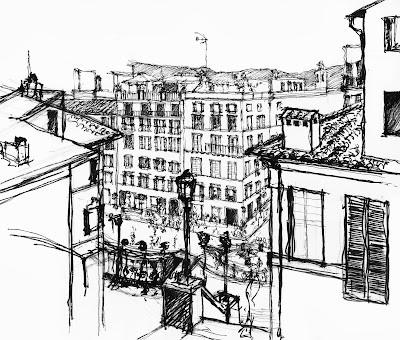 Urban Sketching (USk) is a global community of artists that practice drawing on location in cities, towns, and villages in which they live, work or have traveled. It is a nonprofit organization that is dedicated to raising the artistic, storytelling and educational value of location drawing, promoting its practice and connecting people around the world who draw on location. USk Chicago is the local community of diverse artists united by a passion for sketching, discussions, socializing and sharing their unique visions of the world around them with others. In fact, the Urban Sketchers motto is "we see the world, one drawing at a time." Has this ever happened to you? You are drawing, doodling really, just to occupy your hand and your mind while you're killing time and then it happens--the critic shows up. Critic: "What are your doing?" Me: "Oh, I'm just sketching the napkin in front of me, having some fun." Critic: "You call that a sketch? It doesn't really look like the napkin." Peeehhaaahooooooo! That sound of a descending missile dissolves all of your confidence and your day ruined with an explosion inside your head. Funny how you suddenly remember that you didn't ask them what they thought. You were just trying to have a little fun with your quiet time. Remember we are "Urban Sketchers." This is what you do. We take ordinary, forgettable objects and things and make them suddenly cool by turning them into a sketch. Ever notice how that TV remote that you handle every day looks more interesting once you turn it into an artistic expression? Or that book of matches, that styrofoam cup of coffee, and even the make-up supplies and brushes on the bathroom vanity. I have often thought about doing a sketch of my sketchbook complete with the sketch that it happens to be showing at the time. That sounds a little bit like the old joke about drawing your image in the mirror and there is a mirror on the wall that also has your image and then the reflection continues on into infinity. While it is true that there are Urban Sketchers who produce some amazing sketches that would be worthy of framing and including in a Chicago art gallery, we all have our very own gallery of which we should be proud. The good sports teams do not focus on their overall win-loss record. Instead they always talk about going "1-0" (one win, no loss) every single game. The same can be said about your sketchbook. Focus on one page at a time, sketch what you see in front of you, and continue to learn from your experiences. 1-0 with every new page, even if your page is on an iPad like my red basket sketch from above. 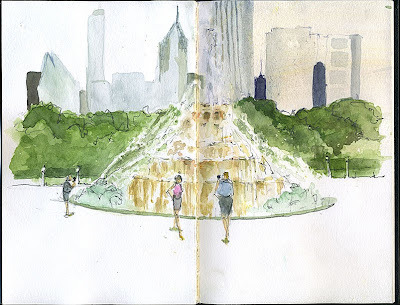 And much like a good sports team, USk Chicago gets together once a month for sketch crawls to share in our love for sketching and exchange cool tips and tricks on how to sketch on location. Think about joining us when you are in or near Chicago. Visit our Facebook group page to find out more and see examples from our members. 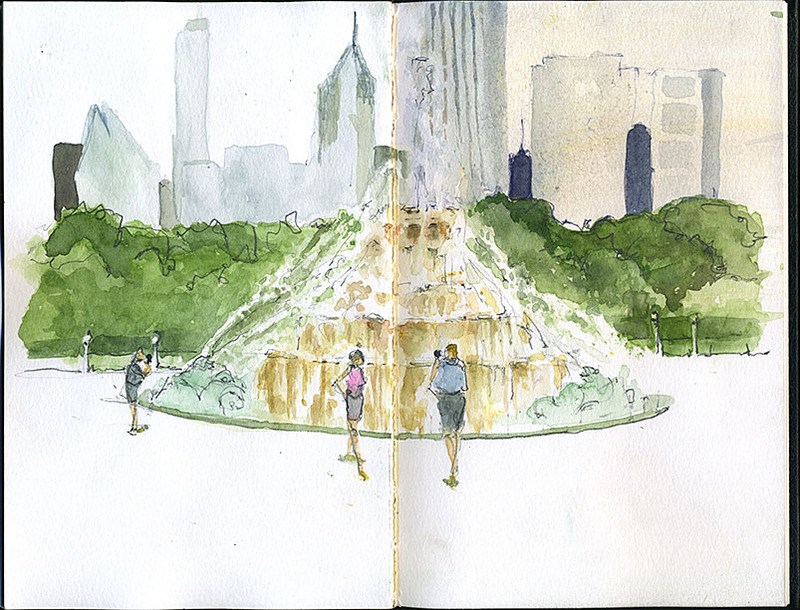 Go to Facebook and search "Urban Sketchers Chicago." To paraphrase the almost cliçhe Nike campaign from years ago, "Just Doooodle It." Whenever I tell someone that I am an Urban Sketcher, I get a number of different responses. "You mean like a graffitti artist?" or "Do you draw all over sidewalks?" 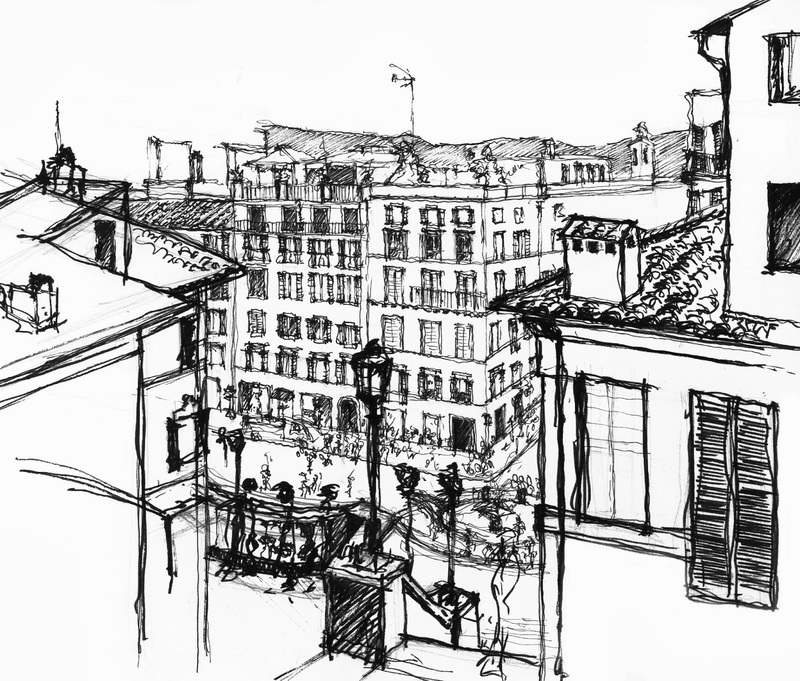 In order to explain what Urban Sketching is, let us first dispel some misconceptions about what urban sketching is not. 1. Urban Sketching is not a super hip retail clothing and apparel chain based out of Philadelphia, PA.
5. And finally, Urban Sketchers is not the country male vocalist who once lived in Australia. Urban Sketching is the activity of capturing a scene from an urban setting, whether that be architecture, nature (such as parks and forest preserves), people going about their lives (there is a whole list of urban activities that people can be caught doing that are just made for the urban sketcher), modes of transportation and any combination of all of these. We sketch with pencil, markers, watercolors, chalks, or anything else we have in our tote bags into our sketchbooks (although I have yet to see anyone sketch in lipstick). 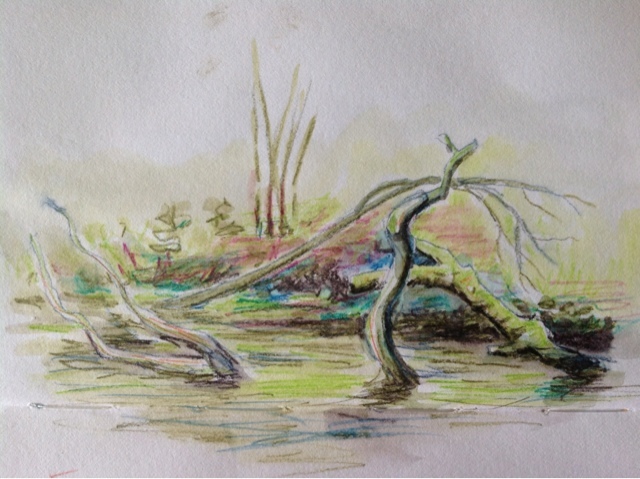 The best thing is that Urban Sketching is a group activity where companionship and sharing of technique is a big benefit to belonging with this group. USk Chicago (USk Chicago) is the local community of diverse artists united by a passion for sketching, discussions, socializing and sharing their unique visions of the world around them with others. 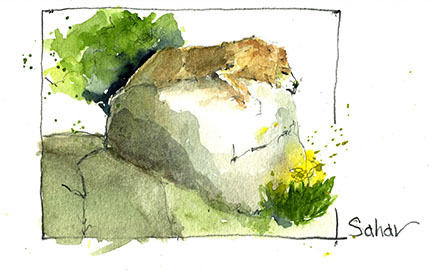 In fact, the Urban Sketchers motto is "we see the world, one drawing at a time." I hope this helps explain the movement in which I am involved. I hope this helps your understanding of it but if you still have questions or comments, please reply to this post and I will be happy to clarify anything for you. There is a phrase in the user experience world that describes how people interact with their electronic devices when they have "nothing better to do"--at least they think they have nothing better to do. Checking the electronic device is, afterall, an efficient use of time, right? Take for example this guy in the sketch I made above (at the Brown Elephant Resale Shop in Andersonville, suburbs of Chicago, IL). While I did not have a conversation with this guy, I know that he was doing the good-husband thing by "shopping" with his wife. The way it works is the happy couple enters the shop together and then they somehow get split up--the wife goes to the clothes and knick-knacks and the husband says he is going to check out the furniture. After a few seconds, when the husband sees that his better half is safely out of range, he pulls out his smart phone so that he can quickly check text messages, Facebook posts, or in this case the Chicago Bears football score. He does this while standing, or hiding, behind the big cabinet in the background. When more and more time goes by, now the husband feels that his wife is really distracted by the cute dress that she found on the rack and a few other items. She gets caught in the tough decision mode. He has now moved onto the couch and the scores of other football games because he is invested in a Fantasy Football league and wants to see how he is doing overall. I see this kind of behavior at the train station, airports, long cashier lines at the store, waiting for a ride at DisneyWorld and, God forbid, at a signal light with moving traffic. The term "weird time" is meant to describe how the person with the electronic device feels when they are in the company of strangers and feel awkward about looking stupid or striking up a conversation. I understand because I am the same way except that I will pull out my sketchbook to comfort those "weird" feelings of awkwardness. I must add that I never sketch while sitting at a stoplight and my sketches are a longer lasting feeling than those filler moments of checking to see if I am still relevant to the rest of the digital world. So what happened with our couple above? Eventually she returned to find him on the couch with his phone and gives him the signal that she is done and ready to go. So he gets up and they leave together laughing about the fun things they had both found in The Brown Elephant. One of the most rewarding things about Urban Sketching and the USk community is the culture of sharing, critiquing, teaching and learning that happens here. If you look at my sketches, you'll notice that the majority of what I draw is Architecture. I draw it more than anything else simply because I really enjoy it. I'm also more familiar with architectural forms because this is what I got a degree in. I guess you could say it's my go to subject. It makes sense too, right? You can hardly escape drawing architecture in an "urban sketch." If you are sketching people in a coffee shop for example, you're most likely going to draw the coffee shop you are in to give some context. Or if you are walking around on the street and decided to sketch oh I don't know, a street festival that happens to be going on, it's going to be really hard not to include some of the architecture that's all around you. So I sketch Architecture. But a huge part of urban sketching is capturing a sense of life in a given sketch. Who is there? How many are there? What are they doing? How are they using the space? Are they having a good time? Not only does including people bring your sketch to life, but it also add's a real nice sense of scale and proportion. In theory, I know all about these things and how to use them, but actually including them in my sketches has been a different story. Figure drawing is difficult for me, but I've been challenged and inspired by other sketchers to add more "life" to my sketches. I took the advice and really liked how this last sketch of mine turned out. 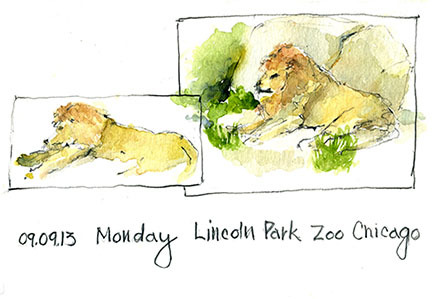 Lincoln Park: Today was the perfect day to sketch outside. There was more than a touch of fall in the shade but the sun was golden and warm. Time flew by! I usually don't sketch the architecture. People and other living things are what catch my attention. Today, I think, I had Urban Sketchers Chicago's next Sunday's architectural sketch crawl on my mind and so the Conservatory caught my eye. It's a little over worked but I had a fun doing it and that's what urban sketching is about for me! I'm down to the last pages in my Stillman and Birn hardbound Beta Series sketchbook. I really love the hardbound book but no one seems to carry them around here. If you know where I can find them please let me know! Buckingham Fountain: It was hot and hazy afternoon at Buckingham Fountain. I'll bet it was 90+°. There was one little spot of shade by a concession stand and it was just that - only a spot but it was enough! A large lemonade, a sketchbook and a few sketching friends made for a nice afternoon despite the heat. 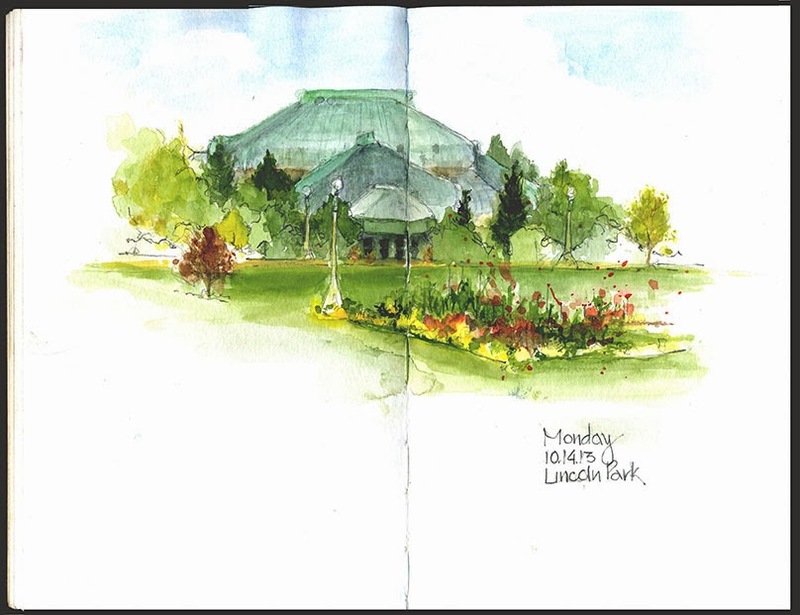 Sunday, I went sketching with the Urban Sketchers Chicago group. It was really wonderful to meet some sketchers I had not met before. 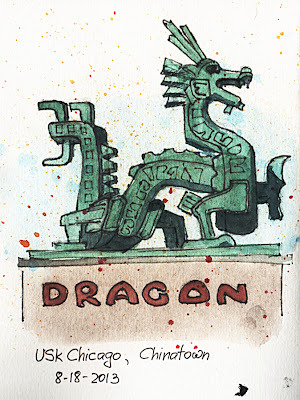 We revisited Chinatown, where we had sketched last year. We are thinking this should be a yearly event. I arrived early (really? ), so while I waited for the others to appear, I did a few sketches, sitting on Cermak Road, facing north. The first sketch is a portion of the Three Happiness Restaurant, and the view up Wentworth Avenue. Next, I sketched people who were passing by or standing around. I loved the young woman who was listening to a tour group leader giving a lecture. The young woman kept fidgeting her legs around, while keeping her arms crossed. Even from across the street, it was obvious that she was bored out of her mind! The next two sketches were done at Chinatown Square, a block or two north of Cermak Road, on the west side of Wentworth Avenue. We were happy to discover that there was a Chinatown Festival happening – and it was very festive! We were entertained with music, young children dancing, many different people and even a procession of monks. I set up my little, bum-numbing stool, and began to draw. When I finished the drawing of the horse sculpture, I acquired a small fan club – two young girls, around 10 and 11 years old, and their twin cousins, the most adorable four-year-old boys. The older girl asked me to draw Angry Birds. (I had to use my phone to find an Angry Bird to draw – the red one, of course!) Then the boys had to have Angry Birds as well. One of the boys asked me to draw a big house. (The house I drew could only have been inhabited with stick figures!) While I was drawing and looking down at the paper, one of the boys kept putting his face under mine, bringing our foreheads together, and staring into my eyes. I’m not sure what that was about! Then the younger girl asked me to draw flowers. I drew everything and gave them the pictures. They hung around for about an hour – a very appreciative audience – and I enjoyed it immensely! I copied the symbol for “horse” from the base of the sculpture. Then, the oldest member of my fan club asked if she could draw the “new” symbol on my page. I was delighted with that! 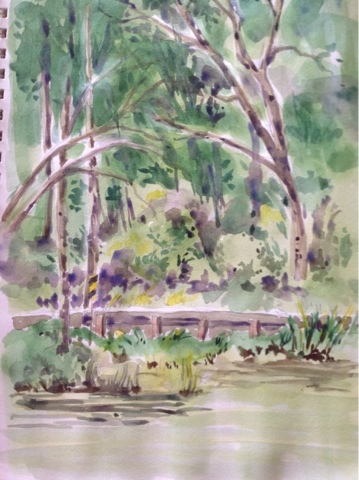 All in all, a great day with the Urban Sketchers!